If you use Google’s Chrome browser, you may have noticed your life is suddenly a lot less cluttered. In mid-February, the search giant rolled out a new Chrome ad filter that automatically removes full page ads, ads with autoplaying sound and video, and flashing ads from mobile and desktop results. The reason? 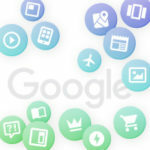 Google says they violate industry standards for consumer acceptability – aka, they’re annoying. 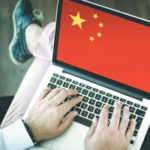 While it could come as a welcome relief for web surfers, the move is raising questions about who benefits from the change, and whether online marketers will suddenly see advertising revenue dry up. In our latest Unwrapping the Secrets of SEO, we’ll look at why now’s the time for marketers to think about finding new balance in the world of search. One of the biggest complaints about web browsing is the frequency in which users are bombarded by advertising. Yet it’s advertising that helps media and publishing giants in particular satisfy a consumer’s news fix without forcing that person to pay for a subscription or one-time use. Digital advertising has evolved from banner ads that many consumers ignore, into flashy affairs that include pop-up overlays blocking text people want to read, or autoplaying video like this Ford advertisement over People magazine’s Chica feature on American Latina news and entertainment. Google has been criticized for the move as being self-serving because it benefits mightily from advertising of another sort: from marketers who pay for prominent placement at the top of search results in the form of Google AdWords and Google AdSense. eMarketer calls Facebook and Google a duopoly: together they accounted last year for about 63% of the more than $83 billion collected in US ad revenue. 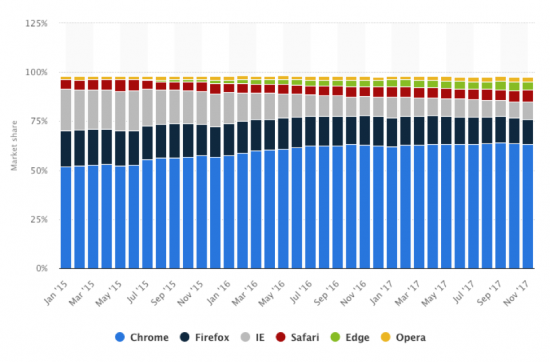 On mobile, Google also has gained in dominance since 2015. So it’s not surprising critics are concerned that one company now gets to decide what users see. Some have noted that ads continue to roll before videos begin playing on Google’s YouTube, while publishers like Forbes had to remove the full page ads displayed before allowing users to view the content they were looking for. The tech leviathan defends the action as a reaction to aggressive ad blocking software that users download for free to prevent distracting ads from disrupting their experiences. 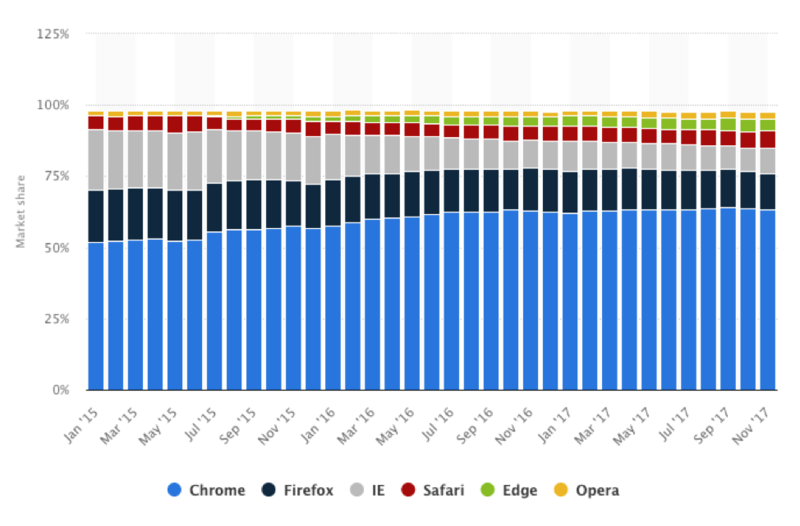 Cynics point to this as the reason Google is cleaning up Chrome’s ad act. The theory goes that unlike other browsers, Chrome users wouldn’t need to download the ad blocker add-ons, making it a more attractive choice. By gaining additional followers on Chrome, Google stands to gain from increased AdWords and AdSense revenue. Most users may not even know about the new Chrome filter and will be unlikely migrate to another browser. And the fear of being blocked may push more publishers to turn to subscription models like The New York Times or Wired, both of whom let you read for free a set number of articles each month before you are required to pay for more. In other words, it’s a win-win for Google and neutral to negative for companies that rely on advertising to stay in business. Google’s move, then, is likely causing a lot of scrambling in ad-reliant companies around the world. 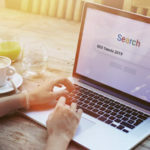 If they haven’t already, executives will need to reexamine the mix of paid and organic search, advertising methods and viral marketing tricks. 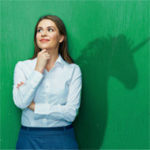 Organic search, which often has the most difficult-to-determine return on investment, could become crucial to success. There are some simple things companies can do on the search engine optimization front to make up for lost visibility out of the pop-up crackdown. The biggest? Rise to a higher position in the SERP. 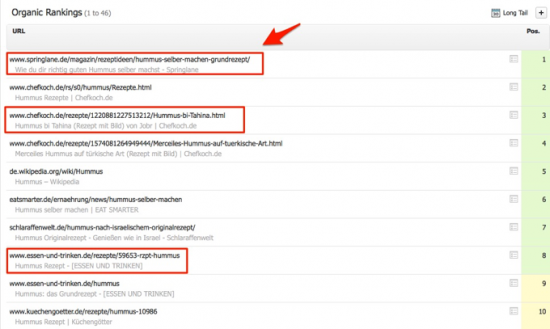 Here, we looked at foodie site Springlane.de. After launching in 2012 its German website, it focused heavily on SEO strategies such as keywords and competitive insights. Springlane also focused on understanding the user intent of searchers and building clear pages – an important factor for ranking high in Google SERPs. For instance, Springlane holds the 1st position for “hummus.” The page title is broken up in clear categories that make it easy for Google to read and crawl – and easy for users to understand. The upstart outflanked both Chefkoch.de and Essen-und-trinken.de, by making the art of making food a visual experience, cutting recipes into simple steps, with just a sentence or two to explain each step. 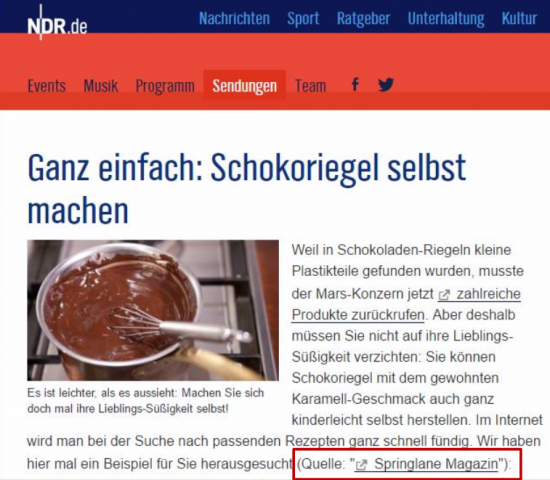 Springlane also built out a link-building program that landed it on major news publishing site NDR.de. It’s a clear illustration that having a good SEO foundation still requires an effective content strategy. Springlane wove the two together to bring users to their site and keep them there, a simple solution to avoiding dumping money into annoying paid ads. Increased visibility puts companies on the path to increased revenue. But not only our core metric, the SEO Visibility, increased a lot. We also noticed a boost in traffic. According to Google Analytics, the traffic has risen by 153 per cent in the same period. These results are a powerful testament to what optimizing pages can do without any digital advertising. Understanding how to optimize existing and new online content is key to improving visibility and boosting the bottom line. Good SEO also makes maintaining websites easier for companies in the long run, and it creates a good user experience to keep customers coming back. That’s just good business. The European Union keeps a particularly close watch on search engines to monitor whether they use size and reach to skew competition in their favor. Even if the US government at some point steps in to monitor how Google wields its power, it will be a long time before any changes are made to Google’s ad restrictions, leaving advertisers and website owners at the mercy of the internet titan for now. Google also points out that the goal is not to block all ads – only those that appear to abuse desktop and mobile standards of excellence. The Google Ad Experience tool shows you how the Better Ads Standards apply to your website. When you use this tool, it serves up select screenshots and videos on your site that it says violate standards. Outside of news, people peddling other products and services will have to come up with workarounds to make sure their products get promoted adequately without breaking the budget. While spending money to reconfigure advertising strategies to comply with Google’s rules may be the knee-jerk-short-term solution, improving your SEO may be the most effective solution in both the near- and short-term.